On Sale Now! Save 3% on the Wright's Silver Cleaner and Polish Cream - 4 Pounds - Ammonia Free - Gently Clean and Remove Tarnish Without Scratching by Wright's at In The National Interest. MPN: 317A. Hurry! Limited time offer. Offer valid only while supplies last. Wright’s Silver Cream is the original, gentle, all-purpose polish for all silver. It removes tarnish quickly, leaving a brilliant and even shine. Wright’s Silver Cream is the original, gentle, all-purpose polish for all silver. It removes tarnish quickly, leaving a brilliant and even shine. It also works beautifully on stainless steel, chrome, porcelain, and much more. 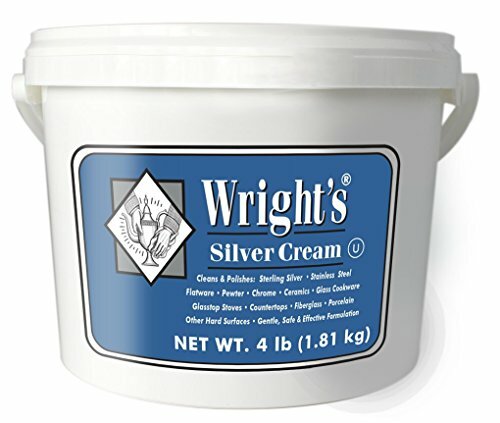 Wright's Silver Cream is the original, gentle, all-purpose polish for all silver. It removes tarnish quickly, leaving a brilliant and even shine; it's not just for silver. It also works beautifully on stainless steel, chrome, porcelain, and much more. Use Wright's Silver Cream to shine motorcycle and auto chrome, remove scratches from CDs and DVDs, brighten go clubs, and much more. This product is Kosher approved. If you have any questions about this product by Wright's, contact us by completing and submitting the form below. If you are looking for a specif part number, please include it with your message.